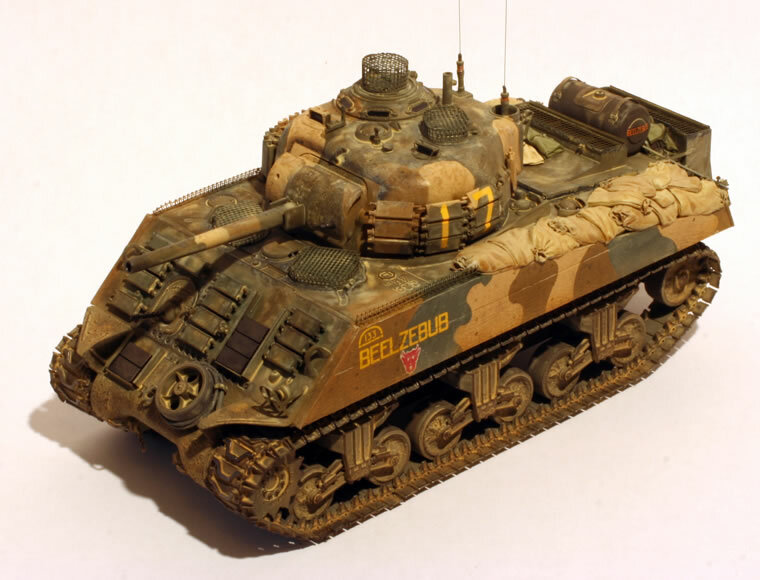 Marine Corps Shermans can be a bit of a trick to model since the modifications used in 1944-45 were often peculiar to individual tank companies within each of the battalions. Likewise, the camouflage was apt to be a bit idiosyncratic. 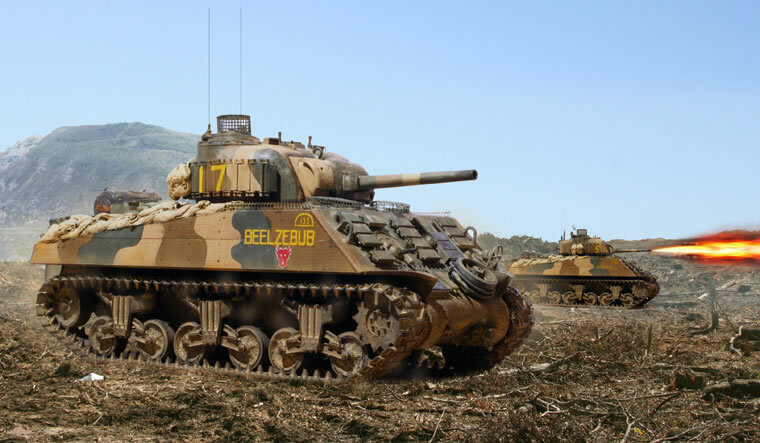 Bison has a set of 1/35th scale decals for the Iwo Jima Shermans, and fortunately, there is some color footage on one of the Company B tanks, Beelzebub, which helps clarify the colors. I took the cheap way out and started my project using the Dragon M4A3. The Tasca M4A3 is definitely an easier approach, but I wanted to use up my stash of Dragon bits as well as the hoard of resin upgrade bits I’ve accumulated. 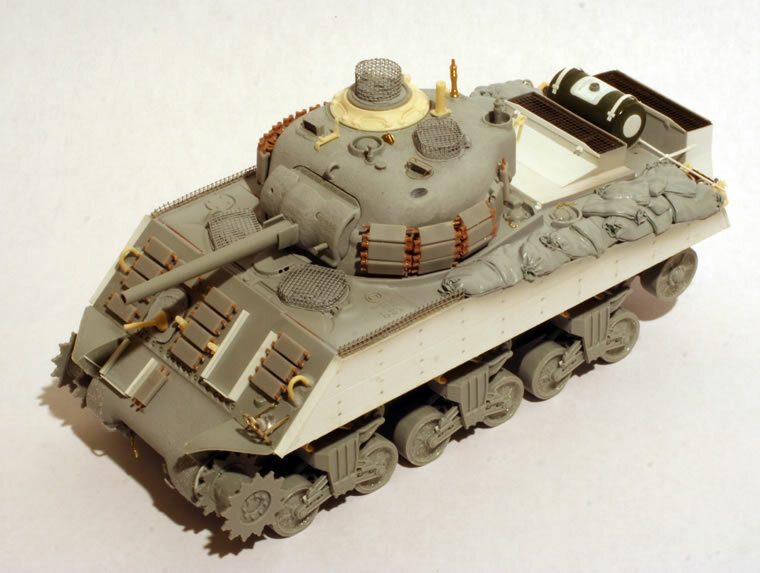 The high-bustle turret comes from the Dragon Marine M4A2 Late PTO kit, which also provided the tracks with extended end connectors. There are several challenges to this kit bash, notably the sand-bag armor, wading trunk adapters, and bird cages over the hatches. I made the bird-cages from Aber “Net” (Siatka) photo etch, while the sand-bags came were sculpted from Kneadatite epoxy putty. The wading trunk adapted were fabricated from .015 thou sheet plastic. 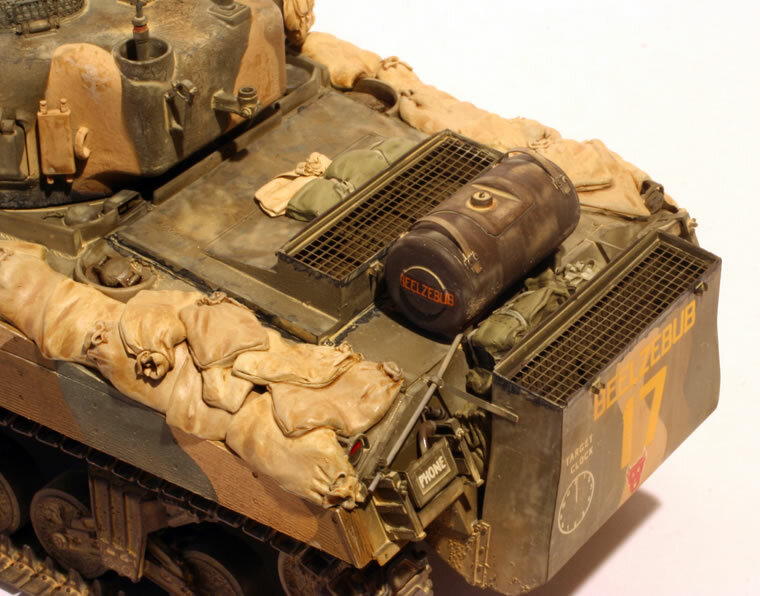 I painted the tank in overall olive drab and the side appliqué armor in sand, brown and green. Overall, this was an entertaining project, but I kicked myself more than once for not basing it on the Tasca kit. A Military Modelling article is in the works.